Dogs need exercise, regardless of the weather. In snow, sunshine or rain, they still need mental and physical stimulation. If they don’t get enough activity throughout the day, they may invent their own fun activities out of your shoes, books, furniture, or anything else that can be chewed on. Of course, there are some days where the weather may be too hot, too cold, too windy, or where you just feel like doing something else with your dog. On these days, it’s good idea to have a variety of ideas for ways you can entertain your dog in the comfort of your own home. And luckily, there are lots of things you can do indoors that may keep your dog mentally and physically in shape. These few dog entertainment ideas may be helpful! Teaching your dog to find hidden treasure, using only his nose, is a great game for your dog’s body and mind. Begin with something simple to make sure your dog understands the game and doesn’t get too discouraged. Put your dog in a “sit” or “stay”, and hide a treat or favorite toy somewhere obvious. Then give him the cue to go find the toy. Once your dog understands the game, you can make it more difficult by hiding the treat or toy in another room, or in baskets and boxes. Let your dog investigate the house and provide a reward when he finds the hidden treasure. There are many variations of this game, so feel free to be creative. It works the same way as the Hidden Treats game, but now you are the treasure to find. You’ll need to play this with at least two people. One person gives the dog the sit and stay cue while the other person hides. As soon as you are ready, your dog can start looking. This game works perfectly both indoors and outdoors, and is a fun way to spend a rainy afternoon with your pet. Food dispensing toys are invaluable boredom busters that keep dogs stimulated, entertained and happy. 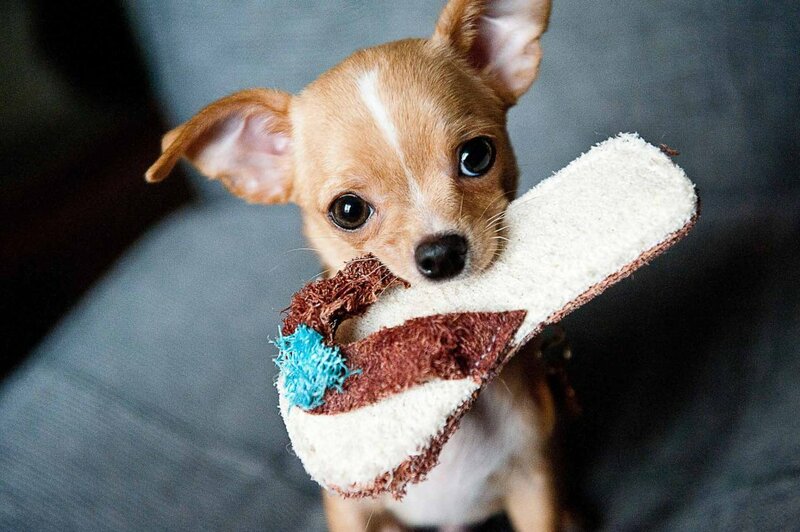 Food dispensing toys can be stuffed with a great variety of treats and tasties fitting for your dog’s taste. There are many different food dispensing toys on the market, but the KONG Classic has been the gold standard of dog toys for over thirty years. The KONG sits upright until pushed by your dog’s paw, or nose, and then periodically dispenses tasty rewards as it spins and rolls. The bouncy, red natural rubber toy is the perfect indoor entertainment for dogs that like to chew. If your dog has a favorite playmate or a best friend, consider scheduling a rainy play date. Before your dog’s pal arrives, be sure to dog proof and hide all breakables and valuables. As you probably know, dog play can get quite wild! Tug of war is a classic dog game that do not require a lot of room. Tug of war can be played virtually anywhere and any ropes and toys available can be used. However, it is important that you have control over your dog’s power and instincts before you engage in a healthy game of tug of war with him. The Three Cup Game is easy and fun. You place a treat under one of 3 cups and have your dog choose the correct one. Once your pup gets the hang of it you can start mixing up the cups and make it more difficult. If you’re inside your dog might not get the regular amount of physical exercise. Do you have stairs in your house? Use them! Have your dog follow along as you do some exercises up and down the stairs. If your dog isn’t clumsy you can also try playing fetch on the stairs. Create your own obstacle course inside your home. Have your dog jump over some towels, weave through his toys and crawl under the table. Just use your imagination. Once your dog has learned how to jump over the towels you then move onto the toy weave. This game will keep your dog’s mind and body engaged. Last but not least, cuddle time! After a nice training session or games there’s nothing better than a little bit of relaxation. We all need time to snuggle up and relax, and many dogs love to lie on the couch with us. What would you do with your dog on a rainy day? We would like to know! How to increase your dog's motivation? Follow these easy ideas! How to make a dog jog your new next best training this spring! Guide about Mange in dogs: What can I do?